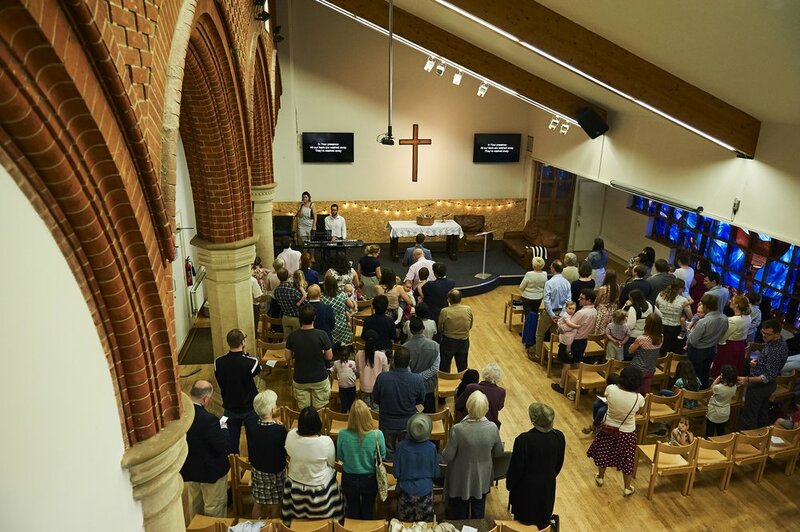 Emmanuel Church is available to hire for a range of uses - family parties; weekly activity groups; conferences; or one-off events. The main worship space is multi-use and we have a range of other rooms available too. For further information, or to arrange a time to visit us and see if we meet your needs, please contact us. This room seats c.120 people and can be set up either facing the stage, or our large stained glass windows (there are projection screens on both sides). We have a full projection and sound system, plus wifi. Our chairs can be stacked & hidden away for other uses and the floor is sprung. Although not a full catering kitchen, our kitchen is well fitted for events. There is a large oven & gas hob; coffee & tea making facilities; fridge-freezer and dishwasher. One of the only remaining parts of the old Emmanuel building, the prayer chapel is a small room that can be used for quiet, meditative activities. It also contains a piano (which can be wheeled into the church if needed). Our smaller meeting room (where our children’s group takes place on Sundays) can also be used with tables & chairs, or as a cleared space. Emmanuel Holloway is a Church of England Church within the Tollington Parish. To find out more about the Tollington Parish click here.